HURRICANE – In the predawn darkness on a clear Saturday morning, thousands of athletes, spectators and volunteers flooded into the parking lot of Sand Hollow Reservoir in Hurricane, Utah, to participate in and witness the swim leg of the Ironman 70.3 St. George. At the swim leg – which makes up 1.2 miles of the 70.3-mile course – the atmosphere was a party with loud music blaring, food and coffee for sale, and nervous athletes warming up and spectators and participants hugging, laughing and posing for photos. For the professional athletes who were competing in the U.S. Pro Championships at Saturday’s race,however, it was all business. The professional men and women entered the water at approximately 6:35 a.m. and were allowed to spend some time warming up before the cannon went off to mark the start. After the singing of the national anthem, the top male competitors began the first wave at 6:55 a.m. with the elite women following at 7 a.m. Following the professionals, the age group competitors and relay teams entered the water one wave at time. The first male age grouper to come through the swim finish was Christian Hanselmann, 24, of Provo, Utah. This was Hanselmann’s first 70.3, said his wife. 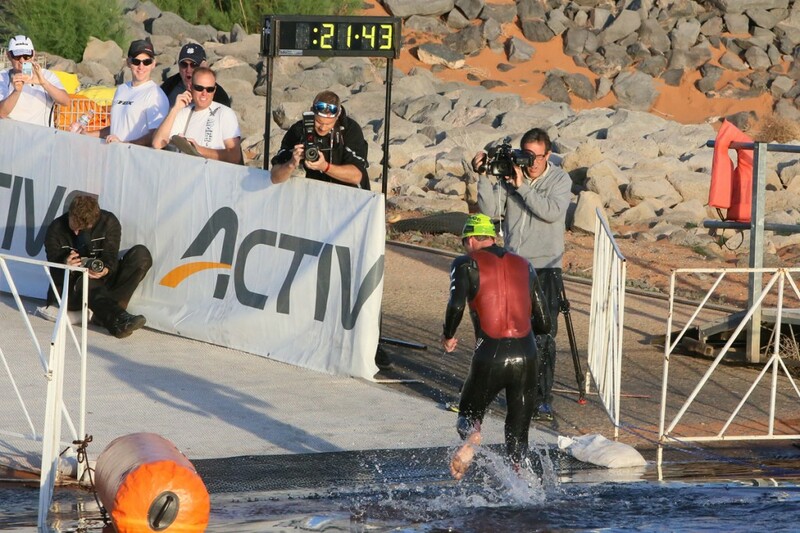 One of the first relay teams to leave the water leg of the relay was Team Aaron Metler of St. George, Utah. The final swimmer left the bike transition at approximately 9:25 a.m., two-and-a-half hours after the elite men’s start.